Despite my cautious nature, I can be a very impulsive person. As I think back on my time in Berlin, I realize that some of my best stories are those based on impulse. One example would be the Passover Seder meal which was originally going to be a paid RSVP dinner at a classy Jewish restaurant, but quickly transpired to me sitting with my legs crossed on the floor of some Israeli female soldiers’ hotel room with three of their male compatriots, singing and chanting in Hebrew and drinking wine. It was likewise this impulsive nature which led me to model in a fashion show during Berlin Fashion week. Another example of my impulsive nature was when I wrote the embassy of South Sudan in Berlin to request more information about the country and found myself in a meeting with two officials discussing the challenges of the country’s development. The meeting was much too intense and in-depth to detail in this blog post, but needless to say, it ignited an interest within me on the challenges of development in East Africa – an area of the world which I am certainly excited to explore more in depth as the next region of my Global Book Challenge. South Sudan, which just celebrated its second birthday this past July 19th, is a land-locked, resource-rich country in Eastern Africa which used to be controlled and administered by Sudan following independence from British control in 1955. The country was plagued by many conflicts including that of ethnicity (Sudan is home to hundreds of ethnic groups – many of which still retain their own languages and customs) and that of religion (Sudan had very close ties with the countries of the Middle East and Northern Africa – sharing Islamic beliefs, as well as the Arabic language – while South Sudan had more believers of Christianity and animism.) These conflicts led to widespread territory disputes, insecurity, tribal warfare, and genocide. This book shares the story of the life of Emma McCune, a British aid worker who fell in love with the area of Sudan. Known for her free spirit, unconventional nature, and fashionable flair, she became well-known throughout the East African expatriate community. Her fame was further enhanced when she decided to marry (in a polygamous marriage, no less!) to a guerilla warlord in the South Sudan region, Riek Machar (who later became the Vice President of the new South Sudan, a position which he held between July 2011 and July 2013.) After throwing herself into her husband’s work, she found herself fired by the NGO, living in a war-torn region with her husband’s bodyguards, and pregnant with their first child. While visiting Nairobi, Kenya in 1993 in the midst of her pregnancy, her car was struck by another vehicle (it is still questioned as to whether or not it was an accident or as assassination) and she and the unborn baby were killed at the age of 29. 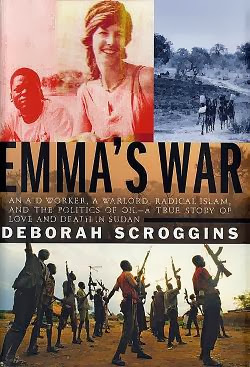 The biography of Emma McCune is interspersed with the author’s personal experiences in Sudan as a journalist for the Atlanta Newspaper. She was sent to the country within a few month of first procuring her job, in order to cover a famine affecting the region. (This occurred in 1988, following the 1983-5 famine in Ethiopia, which gained wide exposure in the West.) What the author found, however, were not only famine and mass starvation, but also slavery, Nuer/Dinka tribal warfare, and genocide. During this famine, an estimated 250,000-500,000 southern Sudanese had died.